Rich chocolate chips pack this huge cookie cake, decorated in icing and balloons with a Happy Birthday message in chocolate. The perfect employee recognition gift or client birthday gift. 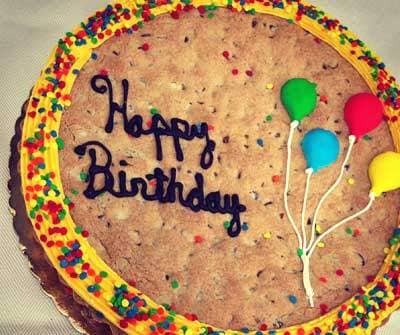 This "Happy Birthday" chocolate chip cookie cake is baked fresh from the finest ingredients, brimming with sweet chocolate chips and festively adorned in balloons and sprinkles. Each cookie cake can be baked to 10" or 6" dimensions. The smaller cookie cake is the perfect personalized gift for an individual. We'd be more than happy to help you set up an Employee Appreciation or Client Birthday Program so that you can take advantage of volume pricing after 5 cookie cakes. The best gifts are surprises. When it comes to corporate gifting, there's no exception. To keep your gift from being lost in the shuffle - or to keep an employee gift from feeling rehearsed - you can take advantage of the power of timing. When you send a gift at the right time, it can have twice the impact of a normal gift. That's why our clients send a birthday cake instead of another promotional gift - it feels personal and shows you took a little extra time to care about the recipient's special day.